Signs play an important role across a wide variety of industries. In the restaurant industry too, they are indispensible. Restaurant signage not only helps in communicating general information about the business, but can even help in letting customers know about the weekly specials, or the menu on offer. In restaurants where customers are focused on their food and enjoying their time, you don’t want your signage to distract them. Yet, your signage – if planned carefully, can help influence the atmosphere, improve branding, convey your message to your target audience, and improve your customers’ overall dining experience. 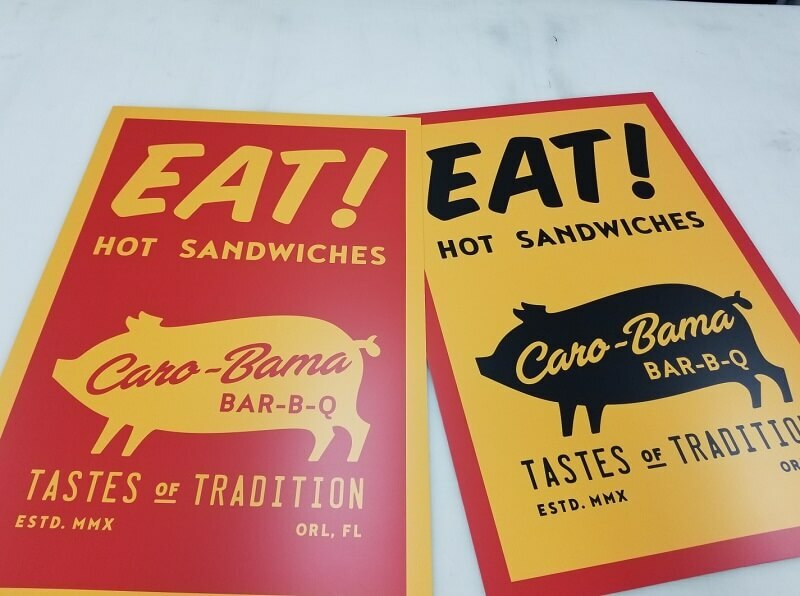 When Caro-Bama LLC expanded to set up Caro-Bama BBQ North Quarter, they needed restaurant signage to match their brand’s traditional look and feel. At the same time, they needed the signs to support and strengthen their branding exercise. And they entrusted Citrus Sign Studio with the job. Brandon and Lora started out their small catering business in downtown Orlando. Their delicious BBQ catering business grew to a food truck (Caro-Bama BBQ Food Truck) with a cult following. 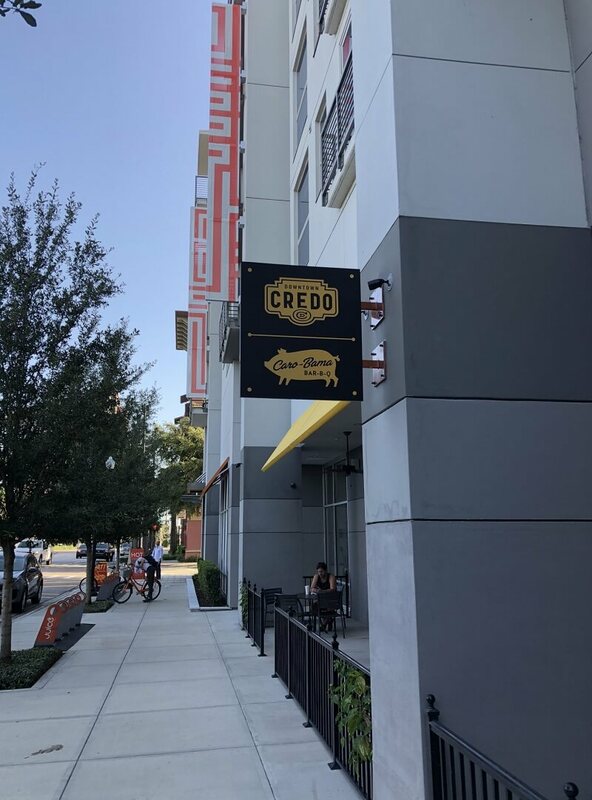 Delighting their customers with authentic recipes that stay true to the tradition, they expanded to set up shop at the North Quarter Market in Downtown Orlando. 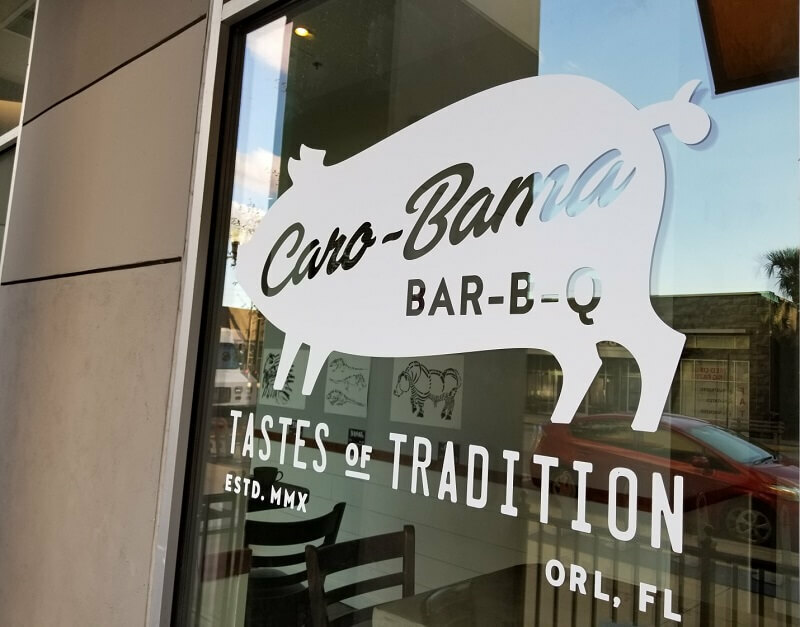 For Caro-Bama BBQ North Quarter, they needed some restaurant signage that would help them grab attention and encourage foot traffic into the restaurant, create a traditional look and feel indoors, incite interest in the brand and help in brand recognition. Citrus Sign Studio designed a variety of restaurant signage for Caro-Bama BBQ North Quarter. To help attract foot traffic into the stellar smoked BBQ, we crafted blade sign designs that were consistent with Caro-Bama’s traditional look and feel, as well as its brand identity. Using Caro-Bama’s signature pig image with Bar-B-Q written in bold, black letters, and using the color scheme of gold and black, we made sure the sign grabbed the attention of street traffic and stood out from the rest, thus luring casual as well as returning customers to step inside and see what was in store for them. 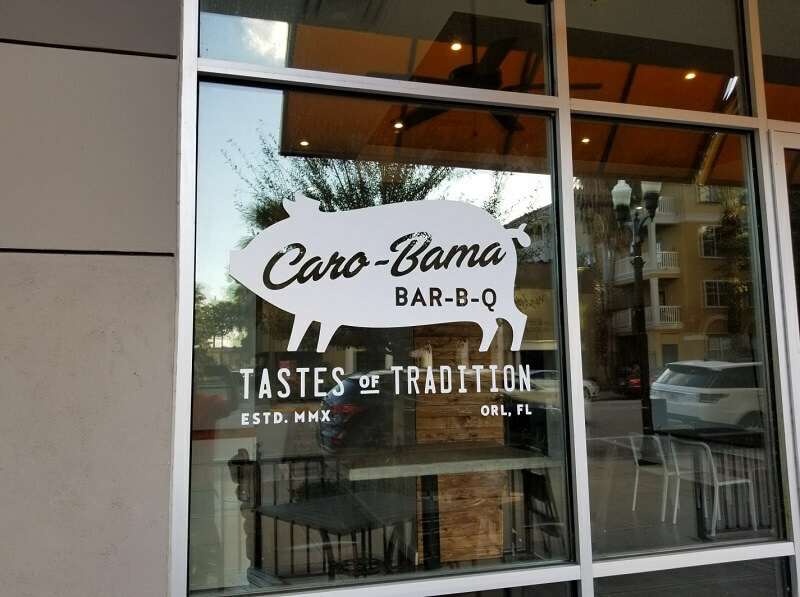 The signs on the glass windows used the same image and words, albeit with a different color scheme, and were accompanied by the tagline “TASTES OF TRADITION” to emphasize on how Caro-Bama serves the best of Alabama and Carolina BBQ to its customers. 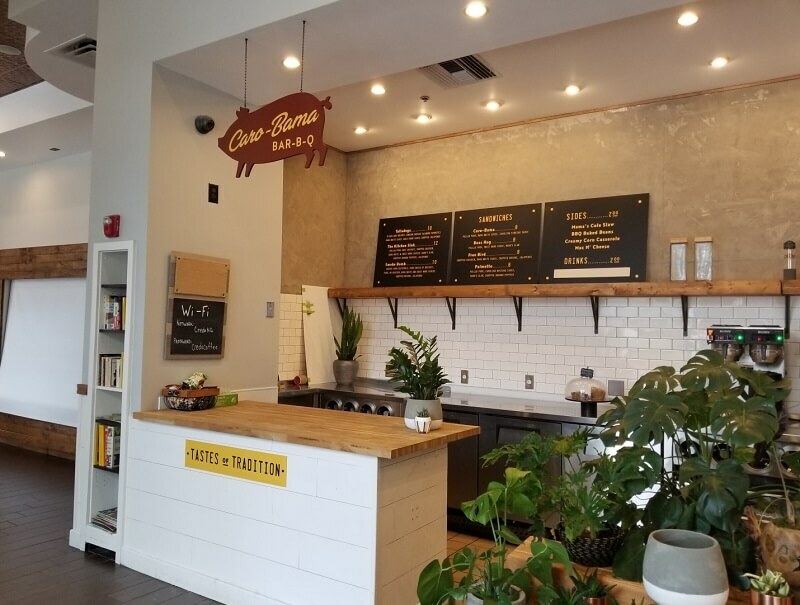 We also designed a pig-shaped old-school hanging sign for Caro-Bama and its menu boards that matched the brand’s traditional look and feel. 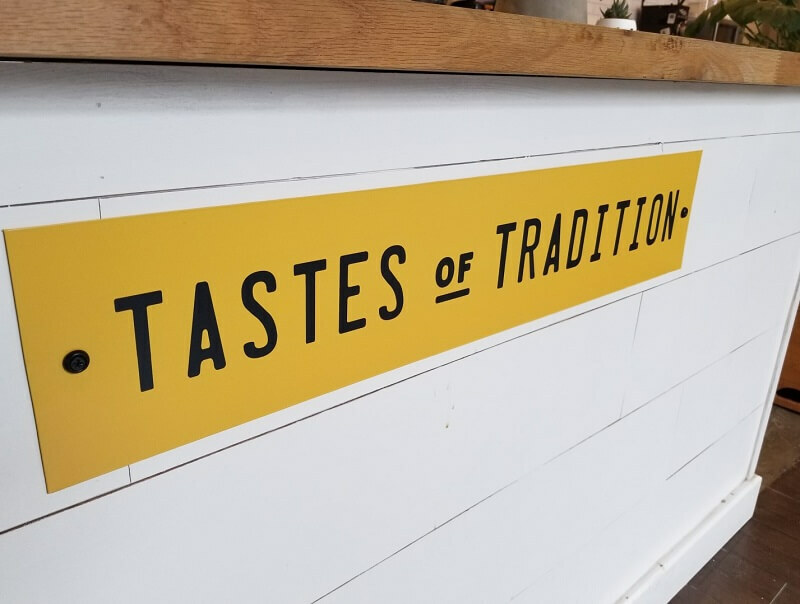 The sign panel at the front of the serving counter displaying “TASTES OF TRADITION” was another step to strengthen branding and entice customers into tasting the irresistible meats and sauces that are a blend of the BBQ traditions of Alabama and the Carolinas. The signages luring patrons to eat hot sandwiches too were an exercise to support branding. The restaurant signage we designed for Caro-Bama were minimalist and had a traditional look to create the right feel for this family-owned business while helping in its branding too. We felt happy and satisfied for having delivered our clients what they were looking for with their newest expansion: Caro-Bama BBQ North Quarter.